Make the most of the season with our guide to summer in Napa Valley. First things first: the weather in Napa Valley throughout the summer is simply spectacular. Daily highs hover in the upper 80s and low 90s, there’s little chance of rain, and yet the San Francisco Bay can be known to send cooling breezes through the verdant valley fields. The skies are clear, the sun shines, and the days are long, allowing lots of time for al fresco dining after a day of tasting and, of course, some stunning sunsets. Looking for a brief escape from the sun’s rays? Cooling cave tours are perfect this time of year! The cave tour at Beringer Winery is one of our faves, a definite highlight of our Collective Tour. Summer is grape-growing season in Napa and it’s when vintners are busy tending to their vineyards, pruning and shaping to ensure optimal sunshine, and trimming grapes to maximize and concentrate flavor. Rolling vineyards are bursting with vibrant greens and deep reds as grapes grow at alarming rates. Of course, grapes aren’t the only thing growing at this time of year! Local farmers’ markets are filled with the plentiful bounty of the Napa Valley. They’re a great place to grab a snack while mixing and mingling with locals. Here on the Wine Train, our chefs love incorporating local produce and flavors into the seasonal menus served aboard our dining journeys. There are exciting events in Napa Valley throughout the year, but if you’re visiting in summer, pack your dancing shoes because you’re in for a treat! Music festivals are a highlight of the summer for many and there are plenty to choose from in Napa Valley. For the past 5 years, Napa Valley has kicked off the summer in style with BottleRock, an epic weekend of outdoor concerts by music’s hottest acts held each Memorial Day weekend. This year’s sold out festival features Muse, The Killers, Bruno Mars, The Chainsmokers, Snoop Dogg, and dozens more! A trip to the northern part of Napa Valley is worth it on a Thursday night, as each week Pioneer Park in Calistoga presents a free live outdoor concert featuring a live musician and offering wine from a different local winery. We can’t think of a more delightful way to spend a summer’s night. For 10 glorious days in July, Napa Valley’s arts and culture scene really comes alive during Festival Napa Valley. From free concerts to elegant evening affairs, solo performances by classical music’s up and comers to ballet galas, and even a day filled with food and drink, Festival Napa Valley is not to be missed. Each August, Napa Valley’s verdant vineyards and rolling hills are filled with the sophisticated sounds of chamber music during Music in the Vineyards, a month-long celebration of chamber music that takes advantage of Napa’s beautiful summer weather and picturesque wineries to put on some incredible concerts that you won’t soon forget. Start the weekend off right with live music on the shores of Napa River. Just across the river from the Wine Train station is the Veteran’s Memorial Park Amphitheatre, home to Napa City Nights, when local musicians play into the warm Napa nights each and every Friday. Raise a glass in celebration of everyone’s favorite season with these one-of-a-kind events in Napa Valley this summer. Why not try something new this summer? Here at the Napa Valley Wine Train, we’re venturing away from our favorite beverage with a weekly trip to Palisades brewery on the HOP Train! Sample some local craft beer and enjoy our signature five-star service. For a night out in Napa unlike any other, hop aboard the Blue Note Express! Get prepped for an evening of incredible live music with a welcome glass of sparkling wine, delectable hors-d'oeuvres, and music by our very own Wine Train Quartet as you journey to Napa’s famous Blue Note for a concert. Our Cinco de Mayo Tequila Train was so popular, we’ve decided to do it again! Celebrate National Tequila Day with the Napa Valley Wine Train, sampling handcrafted tequila from Casa Dragones alongside some perfect paired gourmet dishes. 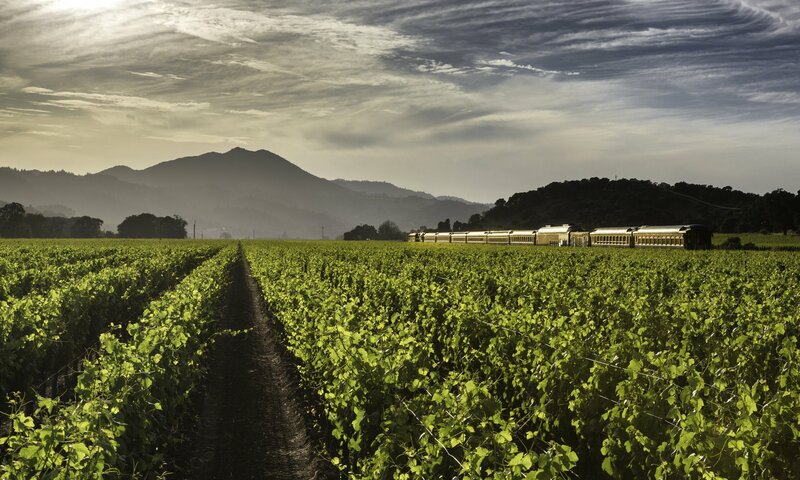 Throughout the summer, Napa Valley Wine Train is giving you the unique chance to meet and dine with the makers behind some of Napa Valley’s most famous and award-winning wines. Dine on a multi-course meal specially prepared by our culinary team that perfectly pairs with wines from one of our winery partners, and learn all about the wines you try from the winemakers themselves. Who else is excited? Grab your sunglasses and sense of adventure and get ready for an incredible summer in Napa Valley.